I've had a picture of Betsuyaku Minoru hanging on my study wall for over twenty years. It's one of my prized possessions, hanging between the sample of Takahashi Tetsuro's calligraphy (a line from Kawabata) he gave me after we published our translation of his eight short stories as Petals Falling in the Night in 1991 and the ghostly end-run print of John Hines about to commit seppuku on the poster Repha Buckman and the cast signed and gave me just before the dinner-theatre performance of my play, Mishima, which she had directed, in Hutchinson, Kansas, in 1983. 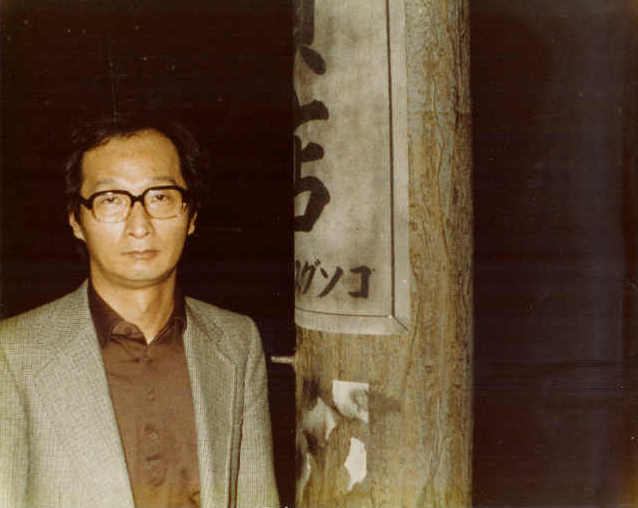 Those pictures of Betsuyaku Minoru and John Hines were taken within six months of one another, in the fall of 1982 and the spring of 1983--but I took the picture of Betsuyaku myself, as he stood there, sober as a judge, beside his symbolic telephone pole, at the opening night performance of Taro no Yane ni Yukifuri-mashita, in Shinanomachi, near the center of Tokyo. picture. It's just a picture of a sunrise to anybody seeing it hanging there on the wall; as they say, you had to have been there--made the miserable climb in the rain, then seen the glory of the sun--to appreciate it. And to find the picture symbolic. So it was with Betsuyaku. There he was, and there was his signature set, that single telephone pole, with its weather-beaten advertising posters. I managed to get them together and took the picture. Years later, that picture was used in the University of Hawaii anthology, Alternative Japanese Drama (1992), that included my translation of Betsuyaku's Matchiuri no shojo (The Little Match Girl), and I was almost more pleased about their use of my photograph, the only photograph of mine ever published, than I was about their use of my translation. At the time I took the picture, Betsuyaku Minoru had been a famous dramatist in Japan ever since he'd won the Kishida Kunio award (equivalent to the American Tony) for Matchiuri no shojo and Akai tori no iru fukei in 1968, but he was still only 45 years old, and was, as he remains, almost unknown in America. I was an American college professor, age 54, on two months of sabbatical leave in Japan, hoping, in my naive way, to help change that (and also managing to see 47 plays and 13 movies--one a day, during that time--so was keeping busy). have ever known personally) had sent me a ticket to come see her opening night performance in Betsuyaku's Mushitachi no hi at the little subterranean Jean Jean Theatre in Shibuya, that had then become one of my favorite places (it only seated about fifty people, but they tended to do avant-garde things for, largely, a college student audience, and I saw a lot of plays there, including imaginative productions of two Shakespeare plays directed by Deguchi Norio). I had been impressed by Betsuyaku's play, which only called for two actors--Sasaki Sumie and Nakamura Nobuo (a well known film actor in Ozu movies)--had then met the author, with the actors and director, briefly for a cup of coffee after the performance. Then, working with that Topeka friend over the intervening three years, I had translated that play, as The Day of the Insects. in a hurry to get away, to be a busy man. So I was a little disappointed. But I'd still found him interesting, in part because he was so independent. I've always liked that. I was also coming to see him as the most significant Absurdist dramatist then active in the world (alive in the world after the deaths of Samuel Beckett and Eugene Ionesco, who were no longer very active even then), the ultimate playwright as thinker--my kind of dramatist. In the two months I spent in Tokyo in the fall of 1982, I saw productions of thirteen Betsuyaku plays (which are easy to put on, with a small cast and only a telephone pole, or a bench, or a hospital bed, as set), performed by dedicated little amateur groups in make-shift theatres for the most part, but probably not to a total audience of 300 people. Kara Juro would have more people in his Red Tent in Shinjuku any given evening. But, in this, Betsuyaku was the typical Absurdist, attracting that small group of aficionados who enjoyed trying to figure out what he was trying to say in these strange plays. I had become one of them, and, in the process, had met a few others, so, with at least half of those thirteen plays, I went to see them with a Japanese friend, who, most often, was at least as puzzled about what the play was about as I was. company (Mishima's old company) that produced many of his new plays at that time (but not all--he had early abandoned that traditional single-company connection typical of most Japanese dramatists that he'd had in the '60s with Suzuki Tadashi's Waseda Little Theatre company). Having purchased my own ticket, and, as I always try to do, sitting in the front row, I wasn't even sitting near Betsuyaku, but saw him there, in the back, and sought him out at intermission. Again he was cordial, but didn't seem inclined to discuss critical questions, or to talk about the play, perhaps because my Japanese wasn't sufficiently sophisticated. I asked him what he thought about Mishima's handling of the same historical material, the famous "Ni Ni Roku" incident, in his short story, Yukoku, for example. He just laughed, indicating that Mishima's treatment would have been very different. I knew that, of course, for Mishima was notorious for identifying with the far right in Japanese politics in the '60s, Betsuyaku almost as notorious for helping to define the far left, so I'd assumed the incident would have had almost exactly opposite meanings for them. I was just using that as an available topic, but, especially given the language difficulty, he seemed to dismiss it as not worth struggling with. thinker, as most Absurdists are. I hurried to catch him again at the end of the performance, to get him to come stand next to his telephone pole, in the center of the stage, so that I could snap a quick picture. Then I suppose he was off to the opening night party with his cast and crew, and I was walking back to the Shinanomachi station, to catch a late train to Denenchofu and my home away from home with Dr. Kosawa's family, reflecting, on the way, upon the strange play I had seen, and the strange man who had written it. After I got back to Topeka, I undertook to translate three more of his plays, choosing those I thought would have most appeal for American readers and playgoers: The Little Match Girl, because it is based on the Hans Christian Andersen story (uses the whole story in voice over) that every child knows, And Then There Were None (first performed in Tokyo about a month after I came home) for the Agatha Christie and Samuel Beckett connections, and I'm Not Her, a simple play posing a mating problem as likely to arise in Topeka as Tokyo. I then used the four translations for a second Master's Thesis at the University of Kansas in the spring of 1985. So I should have known Betsuyaku's work fairly well by then. But he was still a puzzle to me as I worked on the translation of a fifth Betsuyaku play, Kangaroo--perhaps the most Absurd--a few years after that, and, occasionally now, as I look into the eyes that look back at me so soberly from that picture I took so long ago. It is a good picture--of the telephone pole, too.